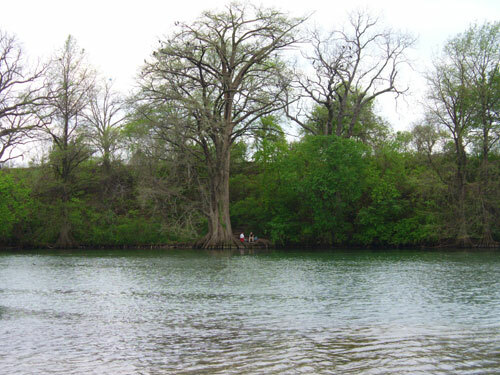 The first lake was dammed in 1893 to provide water and electricity for Austin, although then it was called Lake McDonald. Power produced was insufficient, the lake silted up and the dam collasped in 1900. Occasional flooding hindered efforts to rebuild the dam, but in 1940 Tom Miller Dam was completed and formed 21 mile long Lake Austin. In 1941 much larger Mansfield Dam formed Lake Travis upstream of Lake Austin and controlled much of the flooding in Austin. 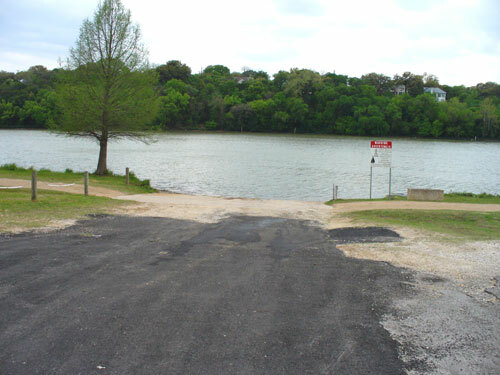 In 1960 Longhorn Dam formed present day Town Lake in the heart of downtown Austin. 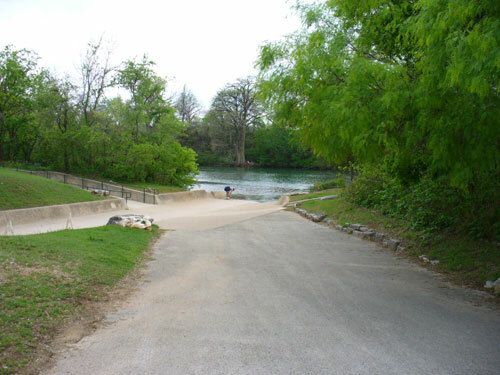 In 2007 the lake was renamed Lady Bird Lake to honor Lady Bird Johnson, the former First Lady of the United States and a long-time resident of the Austin area. In renaming the lake, the City Council recognized Johnson for her dedication to beautifying the lake and her efforts to create a recreational trail system around the lake's shoreline. 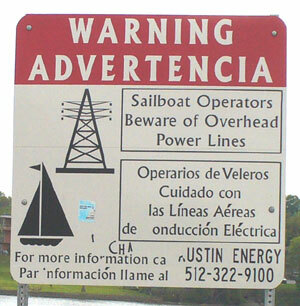 Power boats are allowed, but their gas motors cannot be used. Only their electric trolling motors can be used. There are a few boat ramps for sailboats, canoes, kayaks and rowboats. The many bridges prevent sailboats of any height from sailing the whole lake, and power lines are there too. I'm not sure how deep it is, some places I could see a current. I remember that around 1980 the fish in the lake were tested and found unfit to eat, which caused the city of Austin to start a citywide project to clean runoff before it reached the lake. 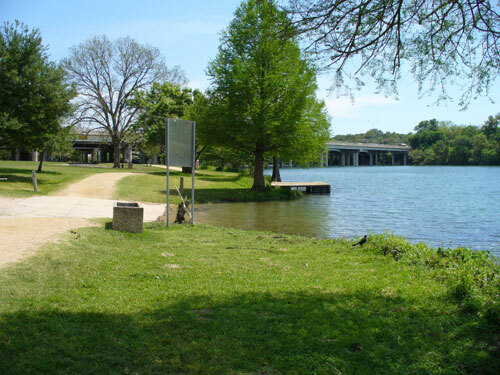 Today the fish are again safe to eat and fishing on Town Lake is permitted. 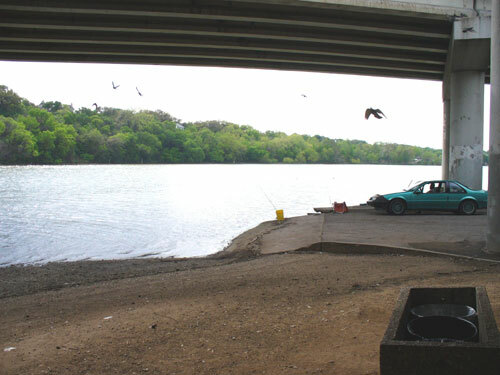 Fiesta Gardens has the easternmost boat ramp. 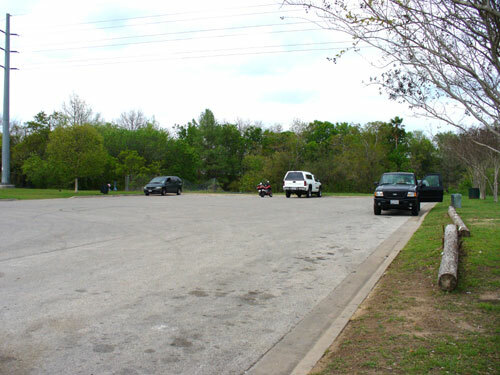 From I-35 take Holly, Chesar Chavez, or any numbered street up to 6th to the east, turn right on Waller, then left on Fiesta Gardens on the north shore to find the boat ramp for the east part of the lake. 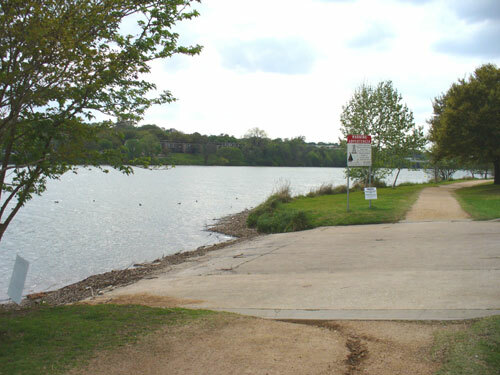 A hike and bike path goes most of the way around Town Lake, at least 10 miles. A small parking lot had room the day I was there, but doesn't really have much room for trailers. The middle ramp is between the two main I-35 bridges, so not a good place to launch a sailboat. It does have good shade and better parking than the other ramps. 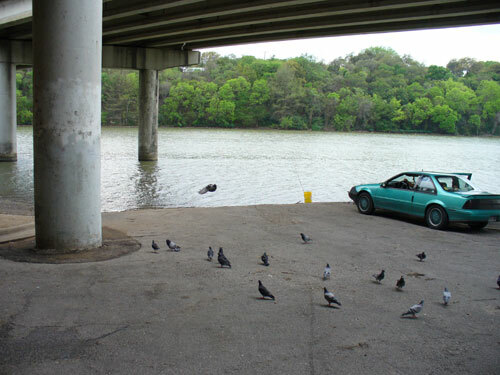 The pigeons liked it here, the fisherman was feeding them. Just west of I-35 is the best looking ramp, it even has a floating dock, although the dock has some metal sticking out it is useable. To get to this ramp and the one under the bridge head south on I-35 and take the last exit before Lady Bird Lake. Vic mentioned the "ramp" behind Austin High School, which is on the north shore just east of Loop 1, so I tried to find it. I found this wide culvert, which was wide enough for a trailer and has pavement leading to it from the parking lot, but it just drops off where it reaches the water! Possible to launch a kayak or boat that you can carry, but you can't back a trailer into the water. Up the culvert several skateboarders were having fun, someone had made some concrete ramps at the sides to practice tricks.